The Moon. Perhaps the most fascinating object in the sky, and surely your most reliable companion in astronomy. If you have ever observed the Moon through a good telescope in a nice, steady night, that's probably something you will not forget. Astronomy is a lot about fuzzy, dim clouds in the limits of perception, and it does not matter if you are glancing at a galaxy millions of light years away; most people are often disappointed by the occasional telescope experience. It is difficult to succeed in conveying the magic of astronomy in a few minutes—but not with the Moon. The Moon should also be your first astrophtography target (with the possible exception of night-sky panoramas). Even a modest tele-lens can get you beautiful compositions. 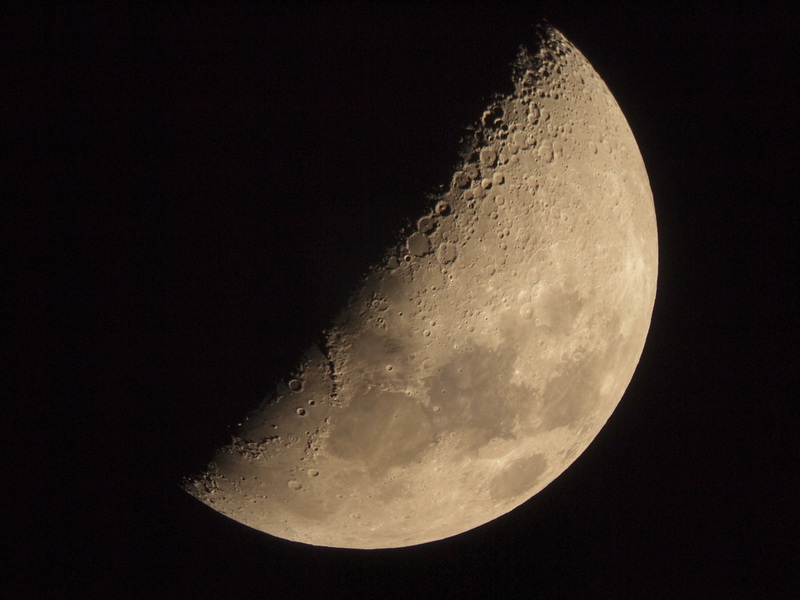 The Moon is the easiest night-sky object to picture because it is big, and because it is bright—and so you can avoid the biggest difficulty in astrophotography: tracking. By the way: the best time to take pictures of the Moon (or observe it with a telescope) is NOT during a full moon. This is because all the detail lies in the line that separates the day from the night side of the Moon, which is called the terminator, I kid you not! Along this line the Sun is either rising or setting as seen from the Moon and, just like here, that means long shadows. 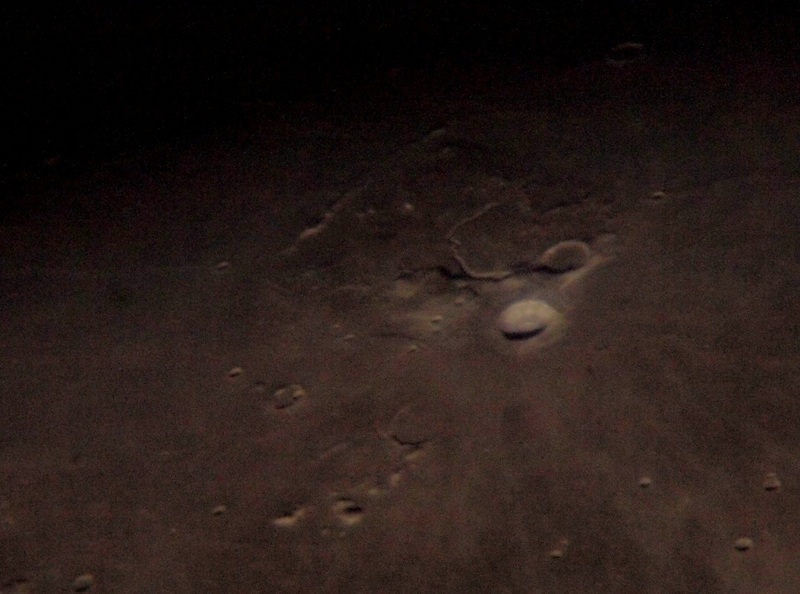 And because everything in the Moon looks about the same colour (more or less), shadows are our doorway into craters and detail. So there you go, no full moons. So how do yo exactly picture the Moon? First, remember: do not ever be ashamed of playing around with what you have. 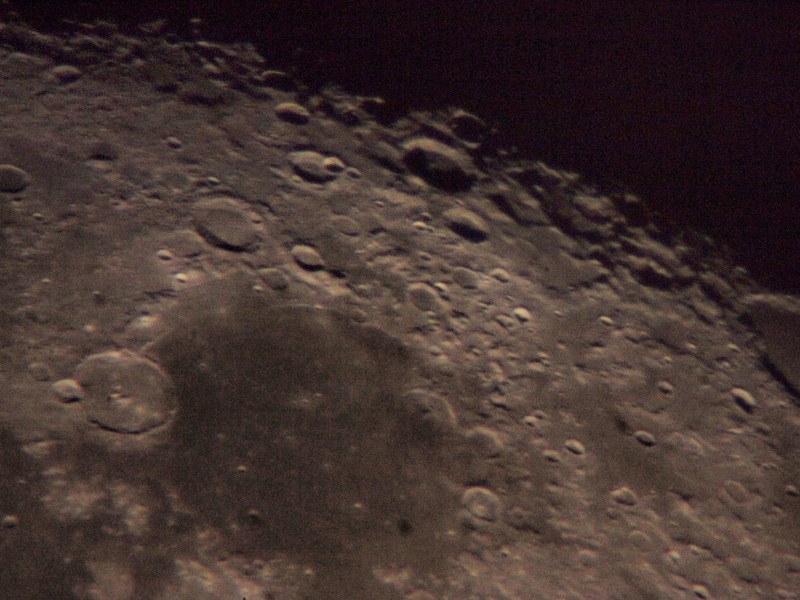 This picture was taken by hovering a compact camera over the eyepiece of a small telescope. That's not how you are supposed to do it (I will explain how), but it works. So do it. And even if you don't like the result, I bet you will learn a thing or two about astronomy or about your camera in the process, so go right ahead. By the way, mobile phones also qualify as cameras. Before anything else, you should try your camera. Just equip your longest tele-lens (or maximum zoom) and see what you get, it may surprise you. Take into account that the Moon is bright, very bright (it can hurt a little through a telescope), and the space around it is dark, very dark, so your camera's sensor can be easily misled. The solution is trying different manual exposures until you get something you like. You should be have no problems here, but if you need to use a tripod with maximum magnification, do it. It is usually when you try to use a telescope as a super-lens that things get tricky. 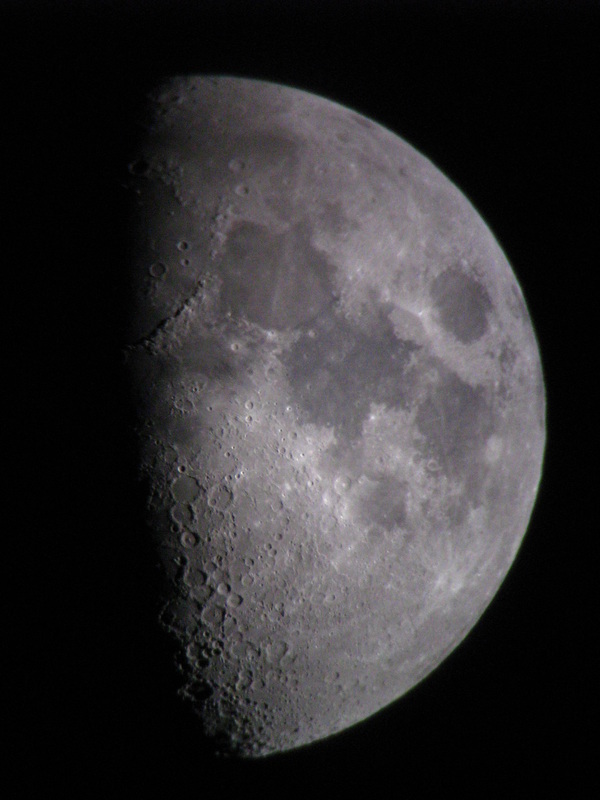 But with the Moon you should still be OK. You just need to acquire your adapter for prime focus or eyepiece projection. In the first case you use your camera, without any lens, as the telescope's eyepiece (or the telescope as your camera's lens). This is the easiest method, providing low magnification and wide field. For eyepiece projection you need to adapt your camera, still with no lens, after the eyepiece (where you would put your eye instead), just like in the hovering-camera method but nicely done. The problem here is the vast diversity of eyepieces, each requiring their own expensive adapters. In my experience hyperion eyepieces work relatively well and sell a very cheap (~15€) adapter which works for most of their eyepieces. In this way you will have high, easy magnification, as will be explained in the planets page. Perhaps even a link to a mini-page! Remember, the Moon is bright. Even using a telescope as a tele-lens (my telescope would be equivalent to a 1000mm lens) you won't need very long exposures. 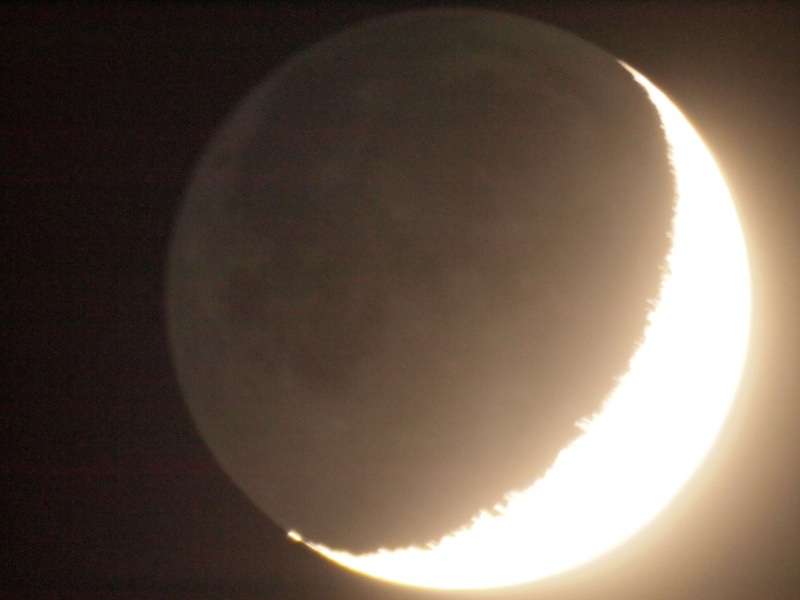 This over-exposed image aims to capture the earthshine, the night side of the Moon as illuminated by the Earth—the reason why we can see the Moon during lunar eclipses. Total exposure was 2", still short enough that I did not have to worry about tracking. Keep your eyes open for canyons! It is easy to get lost in all the craters and detail of the Moon, specially if you are just exploring with the naked eye. Take your time. Dwell on small details. It will pay off. If you really get into Moon observation, I recommend you buy a good atlas so you can check your discoveries and look for specific features as the lunar phase evolves. Do you want to know why the Moon looks so big near the horizon and why it is so BIG in some pictures? See Moon perspective to find out.